Lalremsiami emerged as the first Mizo sportsperson to have won a medal in the Asian Games. 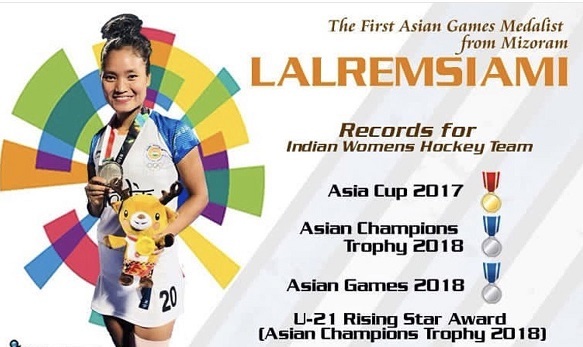 Lalremsiami was part of the Indian women’s hockey team that won the silver medal at the Asian Games 2018 in Jakarta of Indonesia. She also happens to be the youngest player in the squad. Siami, as she is fondly called by her teammates, is believed to be the brightest prospect in Indian hockey and was awarded ‘the Under-21 rising star award’ at the 2018 Asian Champions Trophy, where she played a total of 31 minutes in five matches and scored two goals, helping India win silver. Lalremsiami hails from Kolasib, 85 km north of Mizoram’s capital Aizawl. Lalremsiami, who belongs to an agrarian family of her State and one among the 10 children of her parents, took up hockey at a very young age. She had represented her school at the inter-school sporting event at the age of 10, she was adjudged as the best hockey player. At the age of 11 years, Lalremsiami was selected to join the state government-run hockey academy in Thenzawl. From then on there was no looking back for this Mizo girl. Eight years later, Lalremsiami got her first call for the senior team, and she helped India win gold at the 2017 Asia Cup. She then went on to represent India at the 2018 World Cup, where she was the youngest Indian player at just 18. Struggling to make ends meet at times, Lalremsiami joined the National Hockey Academy in New Delhi in 2016. Is China preparing to offer settlement for border dispute soon?